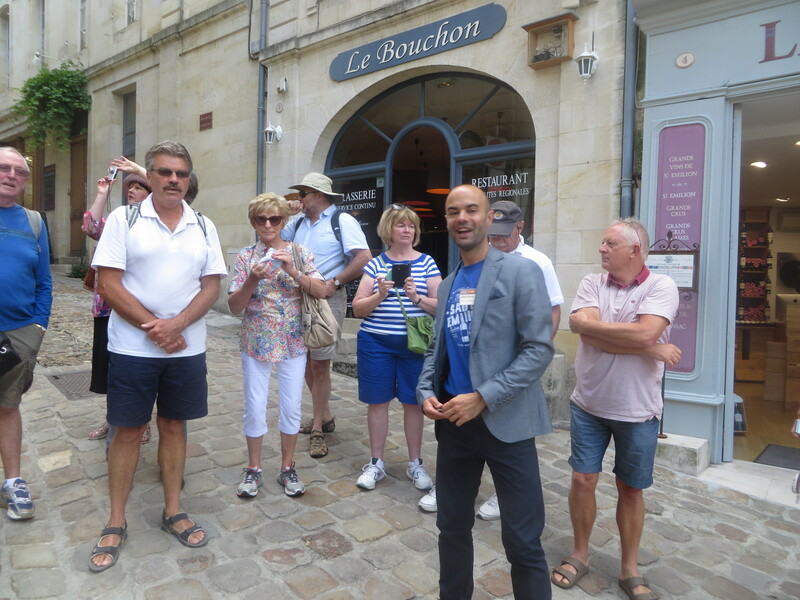 Walking through the cobblestone streets with our passionate tour guide proved money well spent. 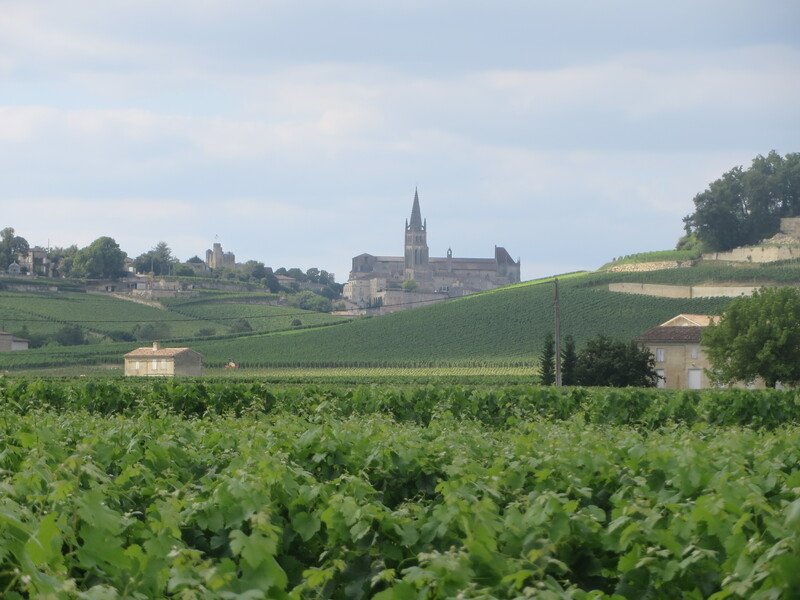 The village, on a rocky promontory & its surrounding vineyards owes their originality to limestone soil. 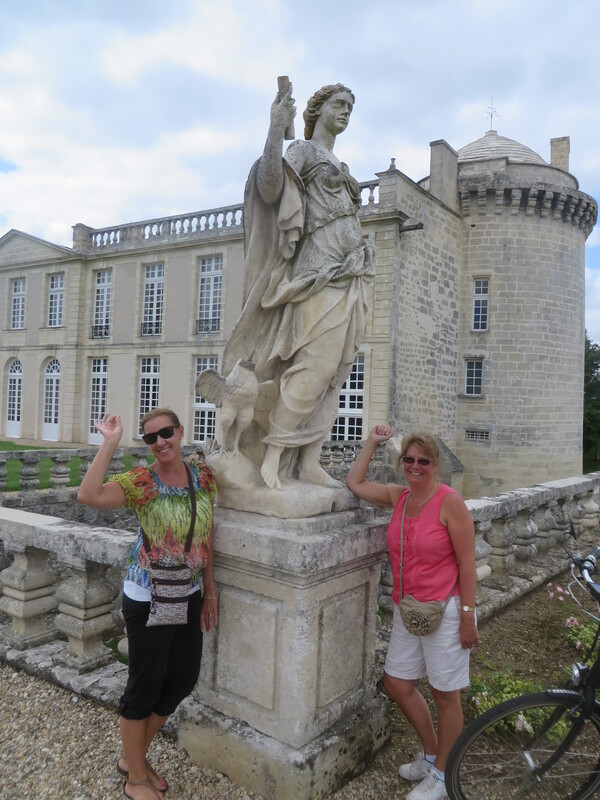 From 8th century to 19th century, men worked hard to extract blocks of limestone to construct the village buildings and nearby chateaux. 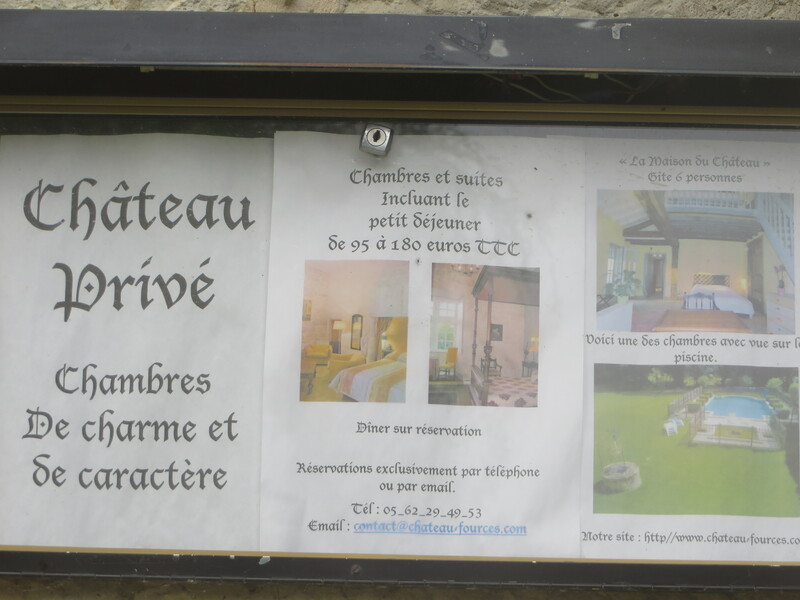 This all accounts for the presence of kms of underground tunnels and the largest monolithic church in Europe! 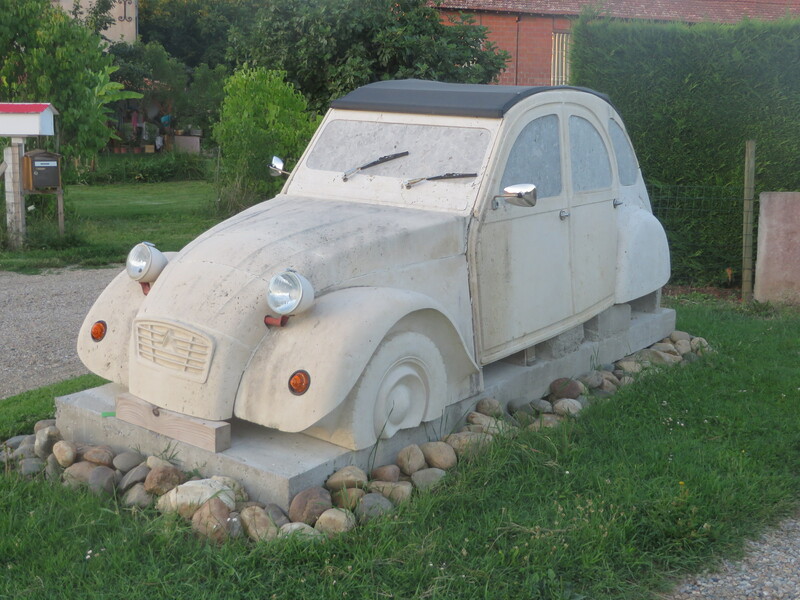 “Monolithic” means – from one piece of stone! 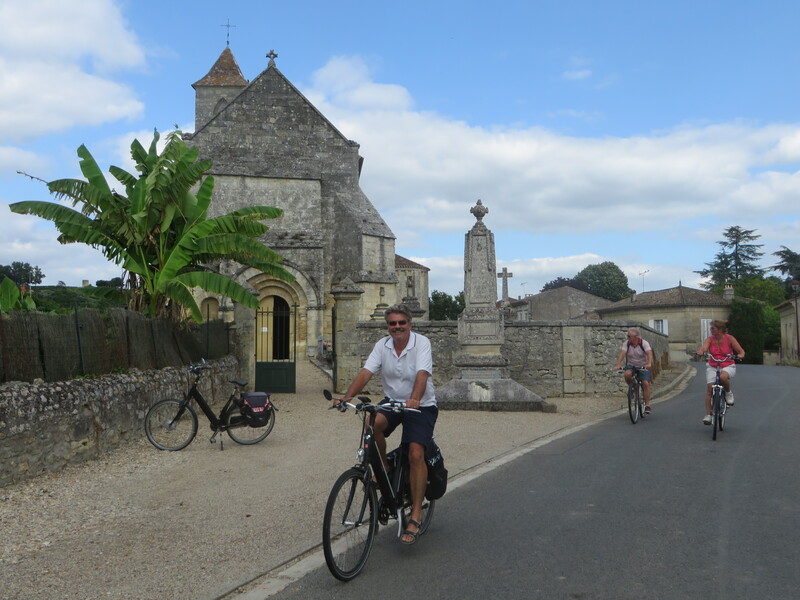 The church is as big as a normal cathedral, however it is carved from solid limestone “beneath” part of the village of Saint Emilion!! 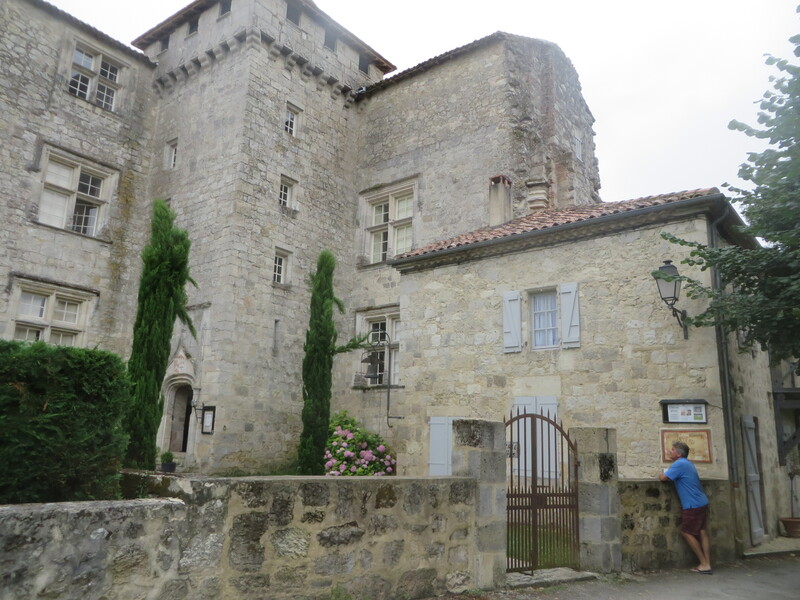 Huge vaulted ceilings, archways, etc – all carved out – rather than built up from – limestone! 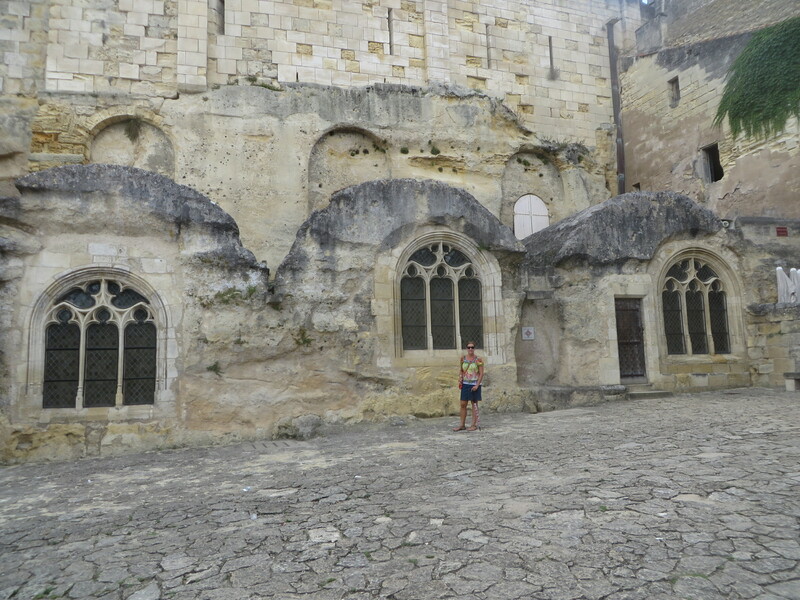 No photos allowed on this part of the tour, however Bev is standing in front of the three windows of the church built “into” the cliff! 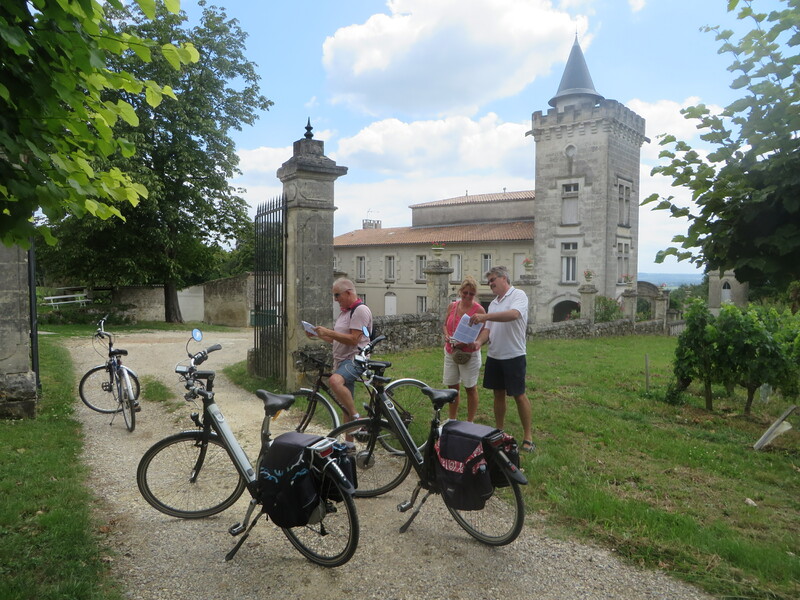 On this tour, we meet Peter and Su from UK who are also camping car and bike riding enthusiasts! 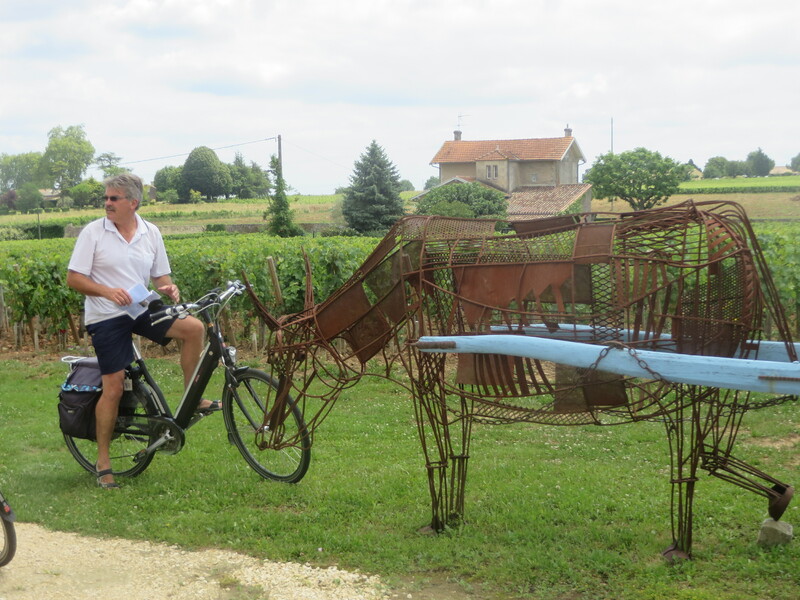 We arrange to embark on our own Tour de France of this beautiful wine growing region for that afternoon! 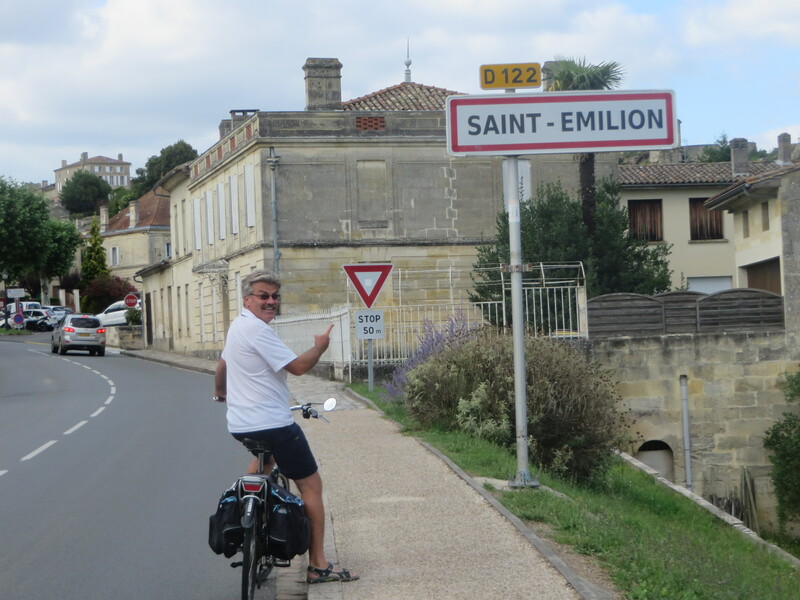 From the tourist office, we obtain bike maps & head off on… La Route de Vins de Saint Emilion!! 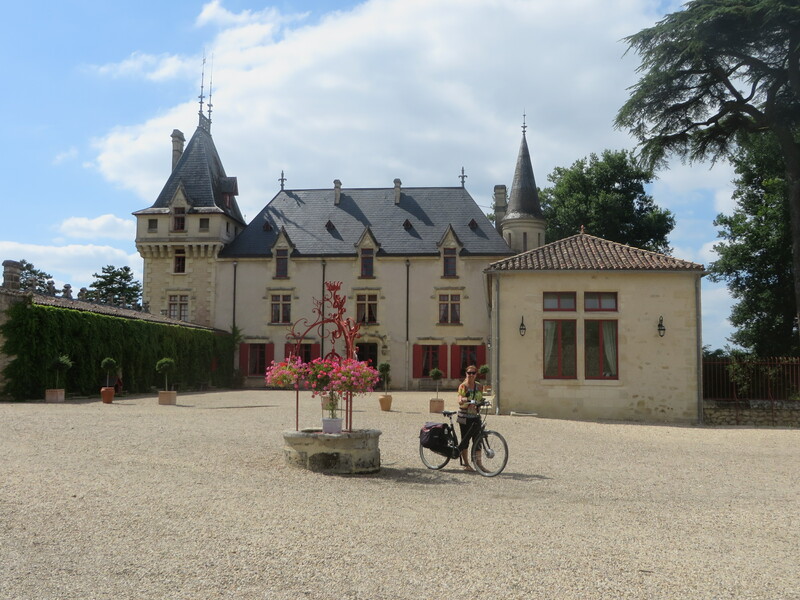 Cycling in perfect weather, by and through many vineyards & chateaux was fun on our 28 km ride together. 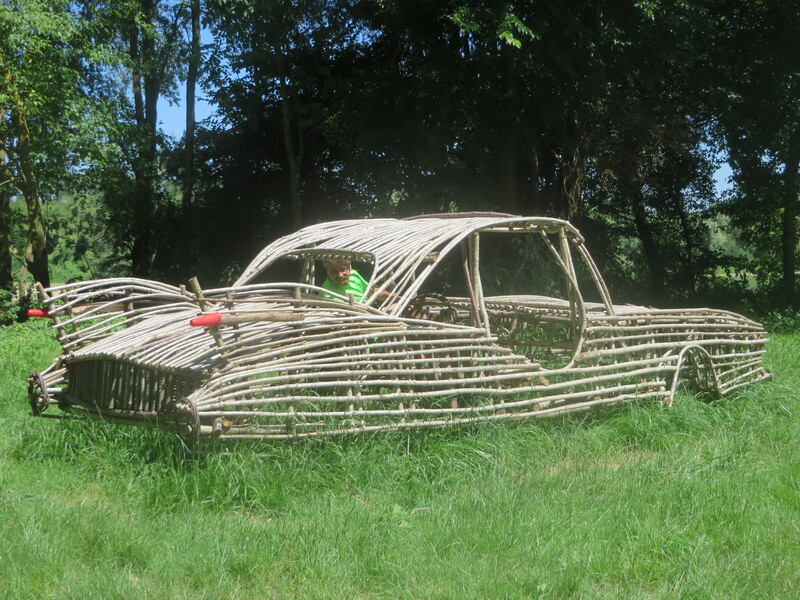 There were breaks for photo opportunities with interesting farm art too! 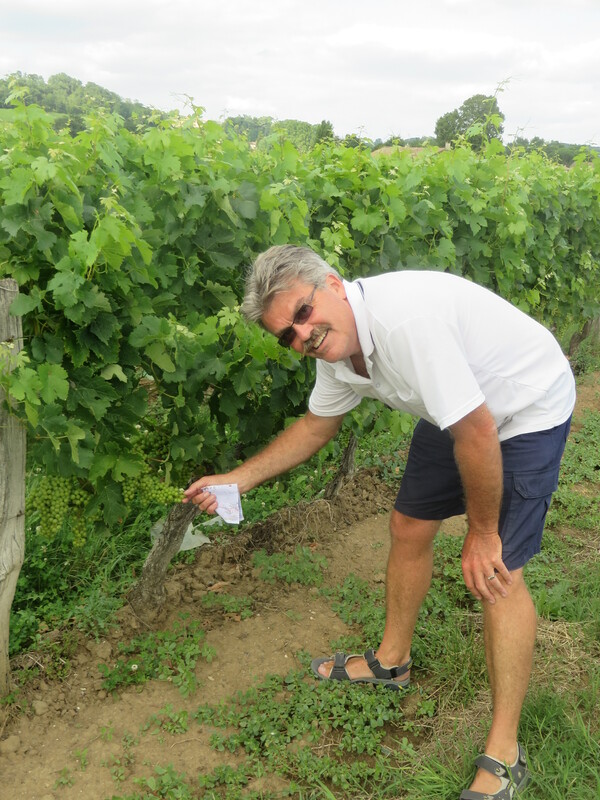 While Bev and Su do some “modelling” near the statue, Mark decided to check out the grape quality. 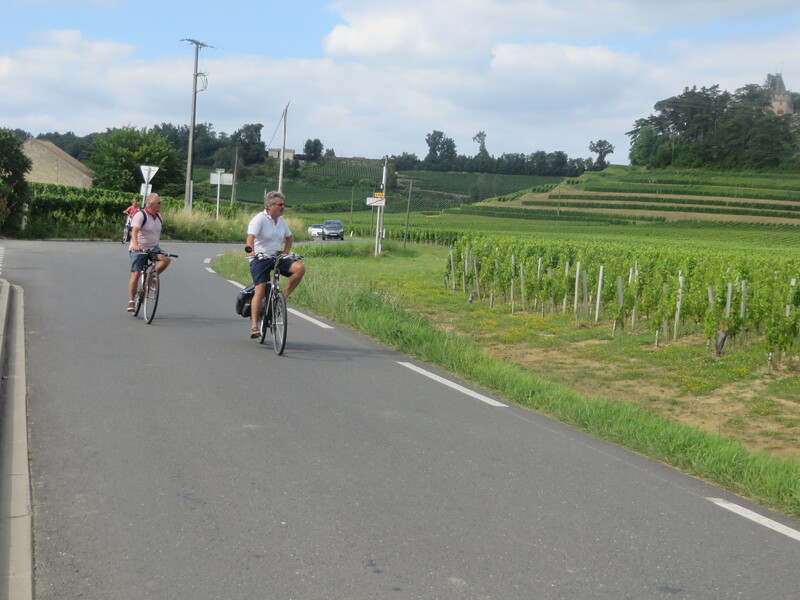 Not long into the ride, Peter commented that at the rate we are stopping to take photos and talk all the time, the two hour ride will take four hours!! Sure enough, it took four hours!! 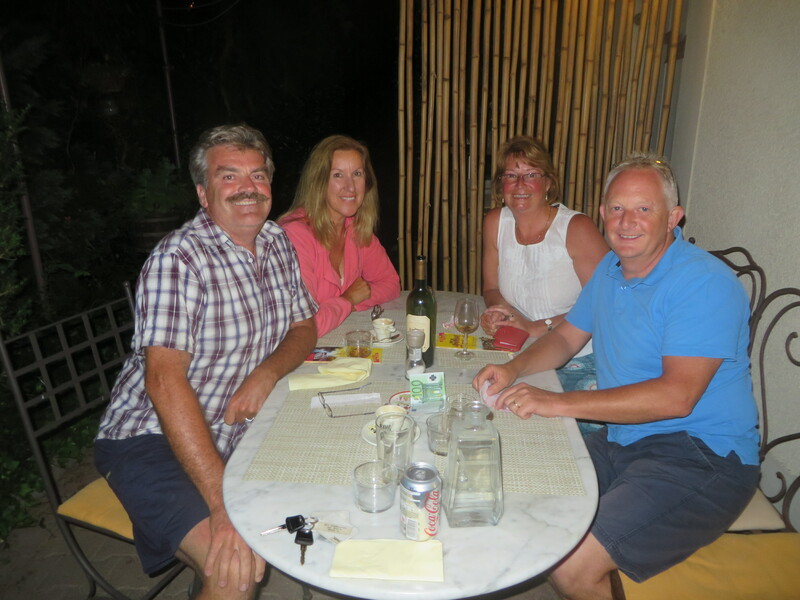 That evening, Bruce joined Su and Peter at the vineyard camping site they had chosen and we all celebrated our excellent Tour de France victory at the local little restaurant!? The fillet of duck with legumes was also a winner!! 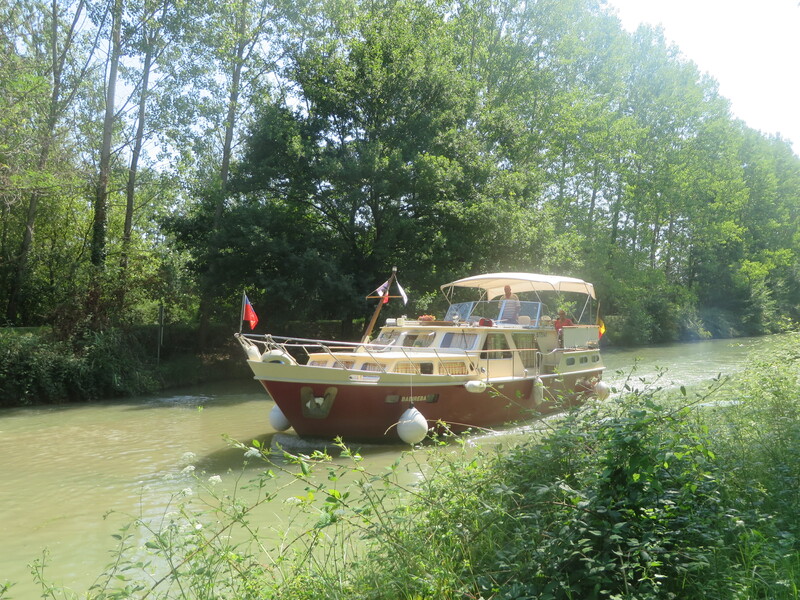 A remarkable engineering feat known as the Canal du Midi built in 1666-81 has allowed navigation from the Atlantic to the Mediterranean! It was the wheat trade that motivated the construction of the canal. 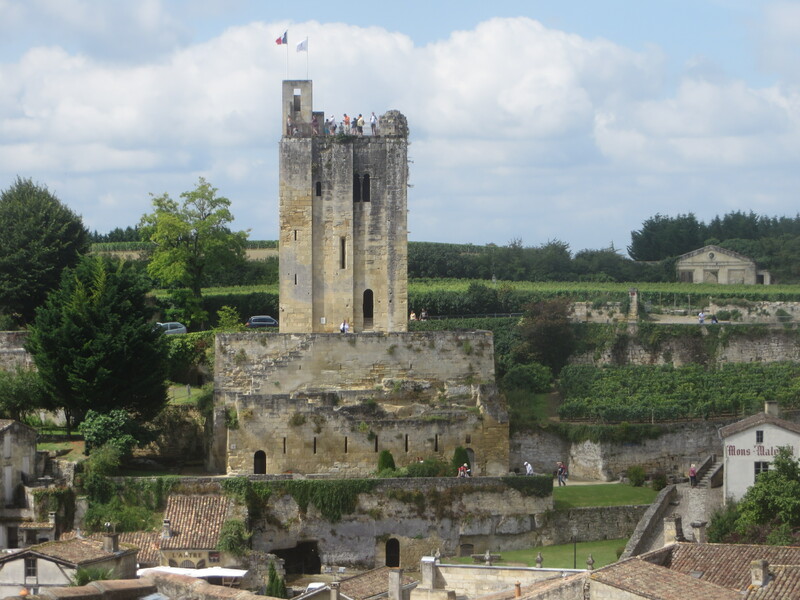 It was considered at the time to be one of the greatest construction works of the 17th century. 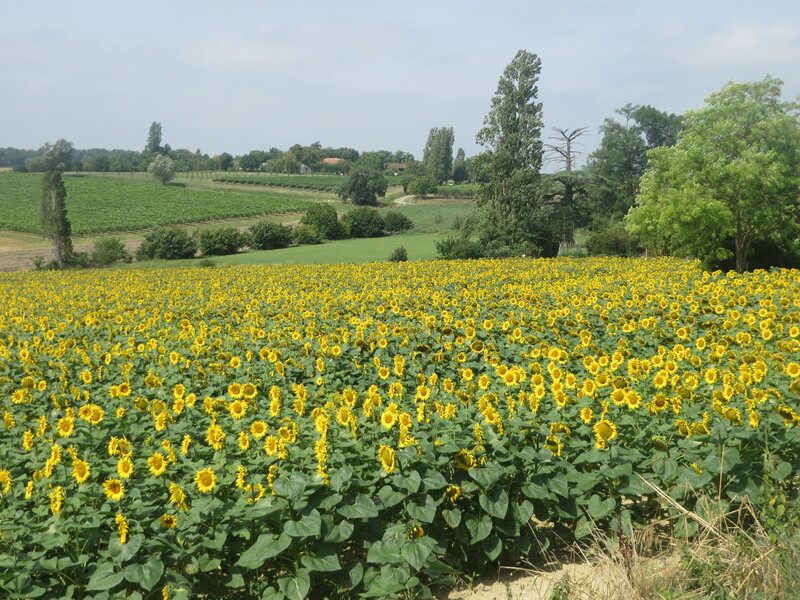 It is 241km long with some 65 locks, 20 metres wide and 2 meters deep. 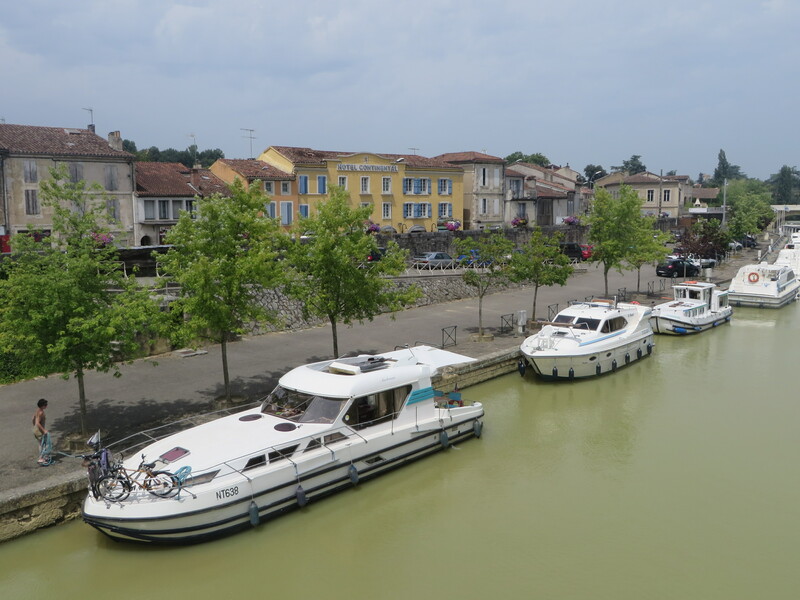 The Canal de Garonne was added later to make it a continuous canal from the free flowing Garonne River at Bordeaux (and hence the Atlantic) all the way to the Mediterranean. 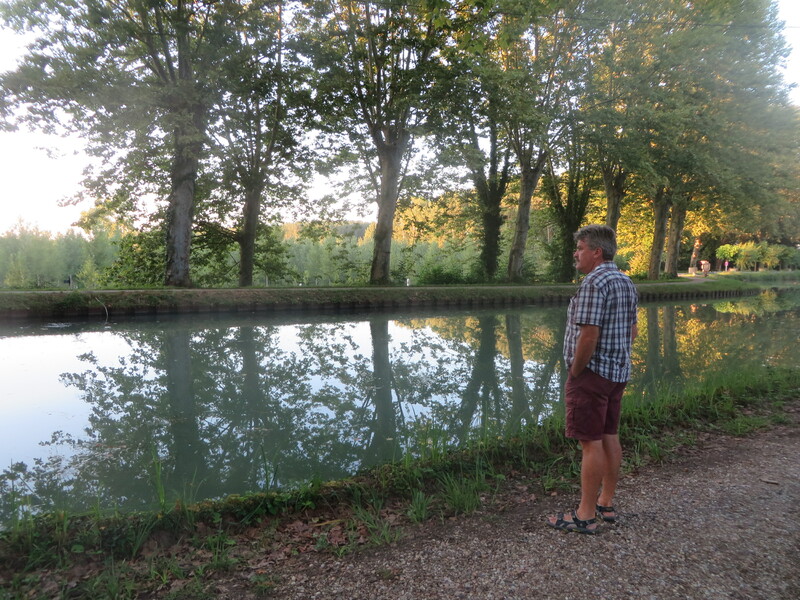 The building of a canal was an old idea. 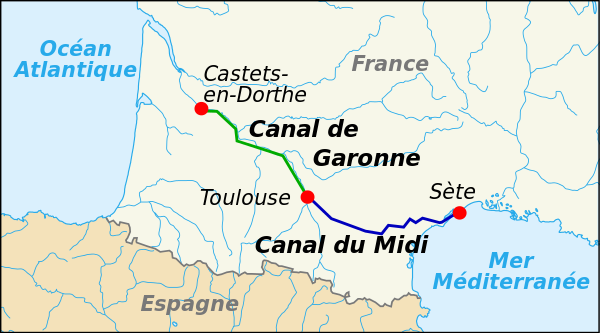 Numerous and sometimes utopian projects were devised to build a canal between the Atlantic Ocean and the Mediterranean Sea. Leaders such as: Augustus, Nero, Charlemagne, François I, Charles IX and Henry IV have dreamed of it as it is a true political and economic issue. King François I brought Leonardo da Vinci to France in 1516 and commissioned a survey of a route from the Garonne at Toulouse to Carcassonne. Construction of such a canal would save vessels (trading vessels but also the king’s galleys) from sailing around the Iberian Peninsula (Spain, Portugal and top of Africa) which could take a month to complete. At that time shipping was fraught with dangers such as piracy and the Barbary pirates. 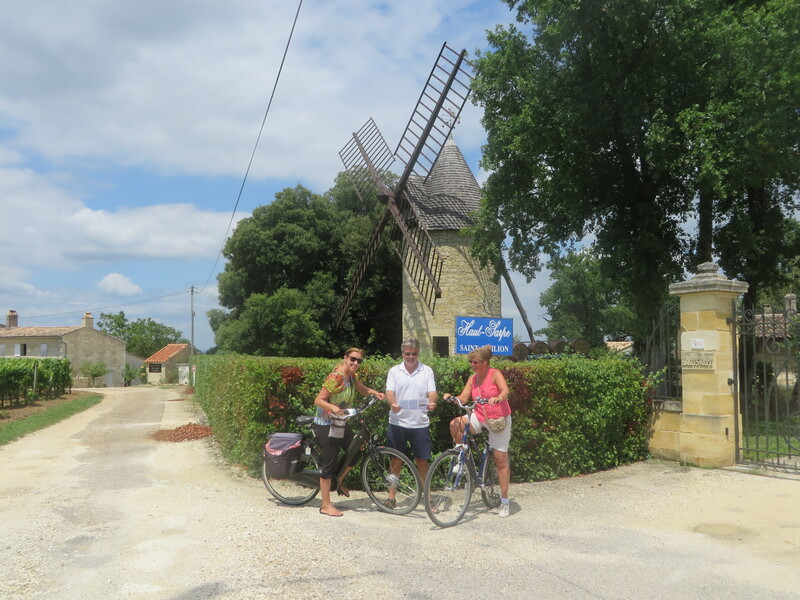 This trade up and down the canals lasted until the 1980’s!! 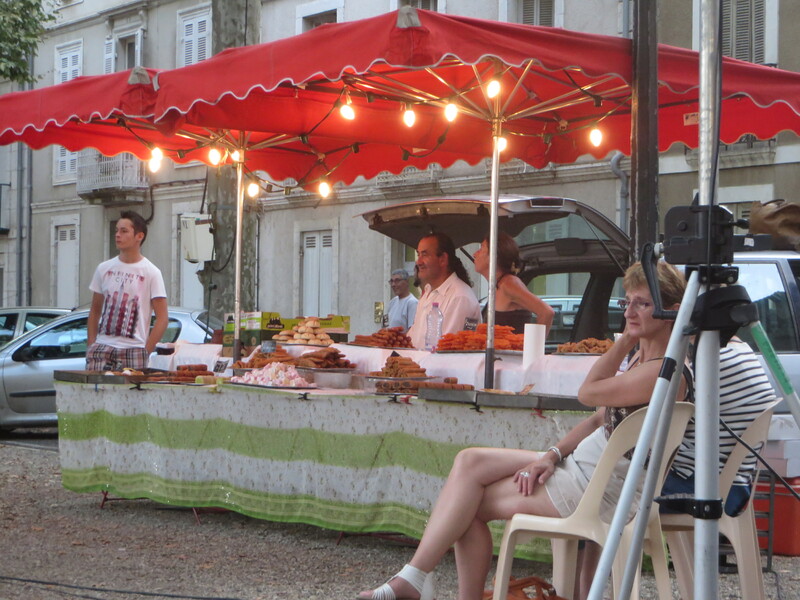 Now it is all tourism. For 250 years, horses have pulled many boats such as fast barges or long commercial boats. A horse can tow up to 120 times its weight when the load is on the water. THIS is why there are such excellent paths on the side of the canals. These have been converted/transformed into bike paths. 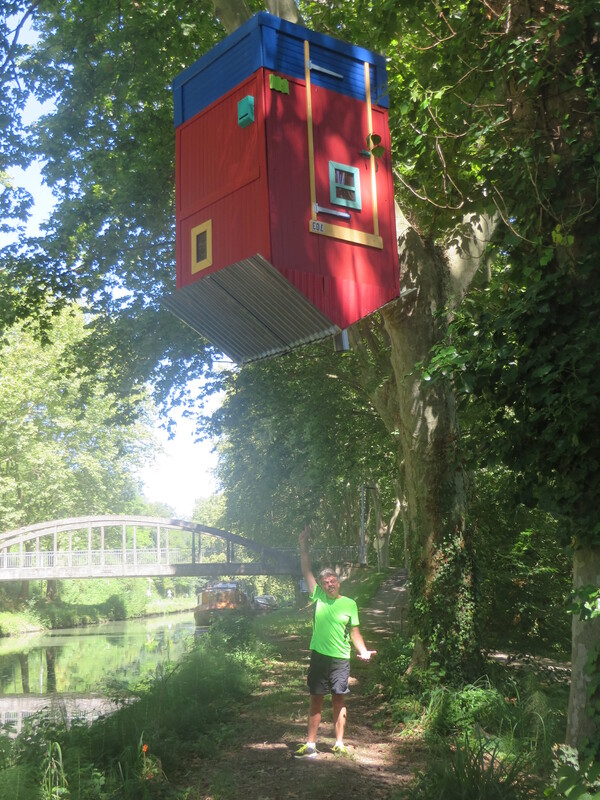 ….Exploring the tranquil canal in the shade from the plane trees is welcome during the heat of the day. 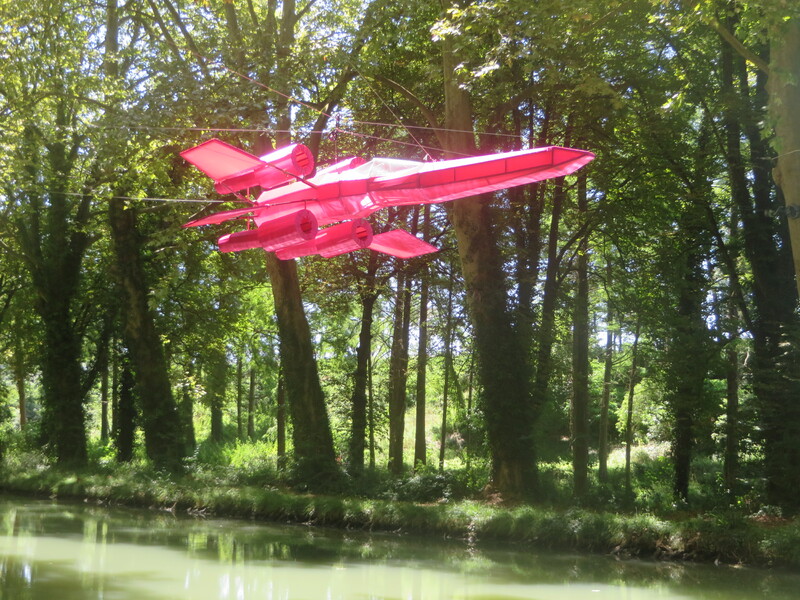 Cars of various designs adorn the paths; upside down houses & pink rockets are suspended along the canal!! 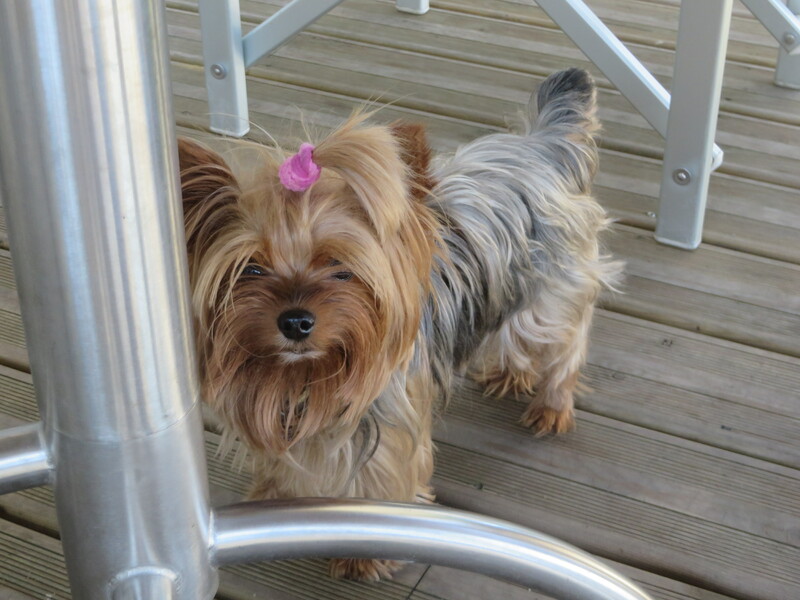 Tres amusant!!!. 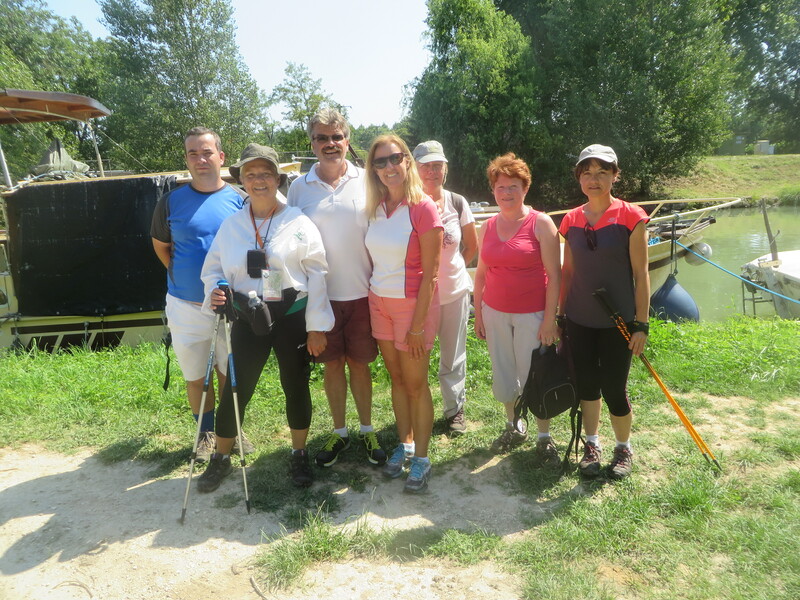 Our morning “power walk” turns into a long trek through the muddy bush after we join up with a group of friendly French walkers we “bump” into!! 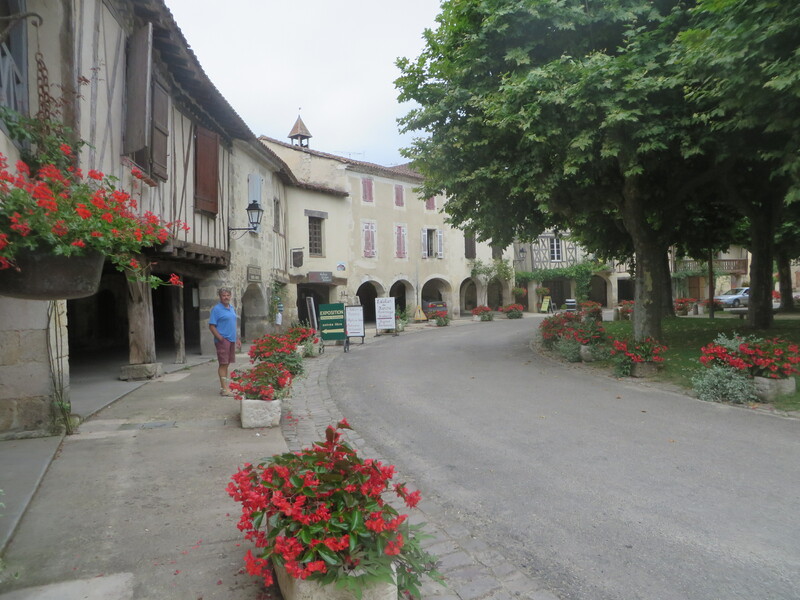 Detours into quaint villages are always interesting. 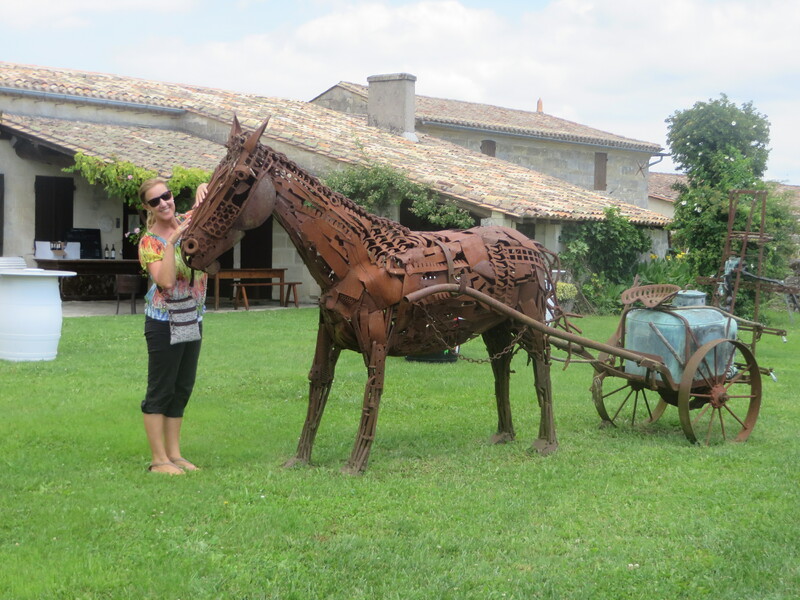 If you get a chance, drop into the delightful village of Lavardac! 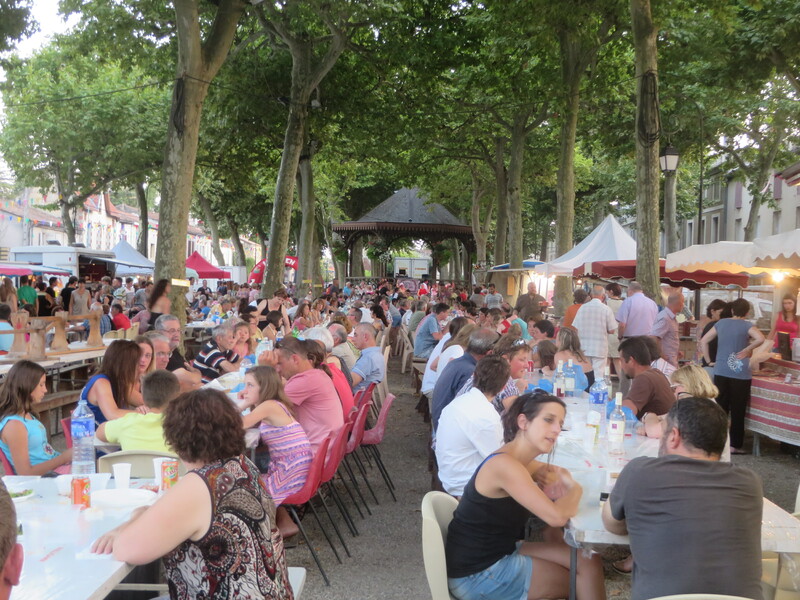 It has an amazing community spirit with the best Office du Tourisme we’ve ever seen! 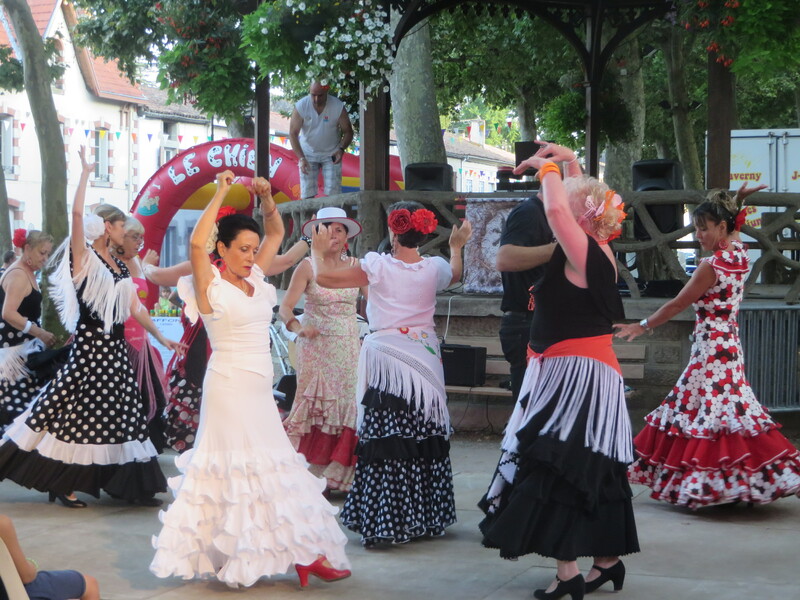 We arrived in time to be part of their soiree night party, held every Thursday evening during July and August in the middle of the town square. 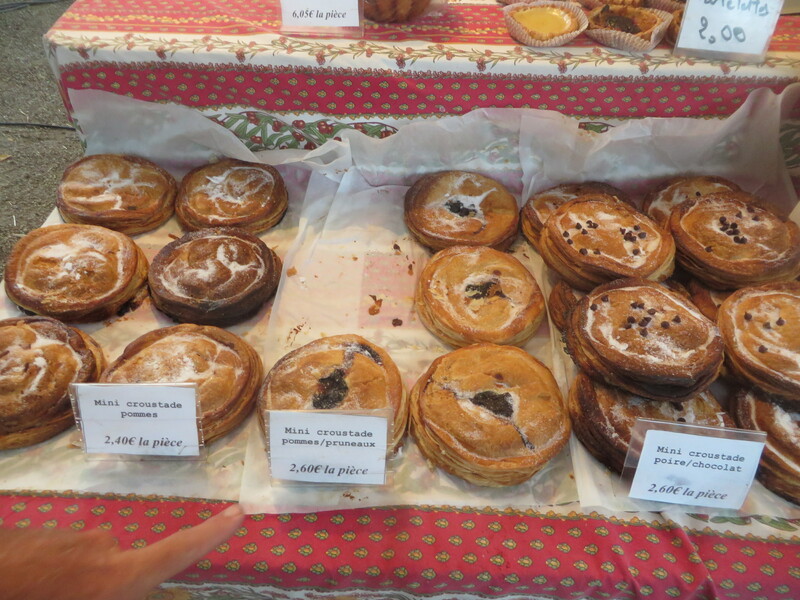 Delicious food stalls offered cuisine to delight your tastebuds! 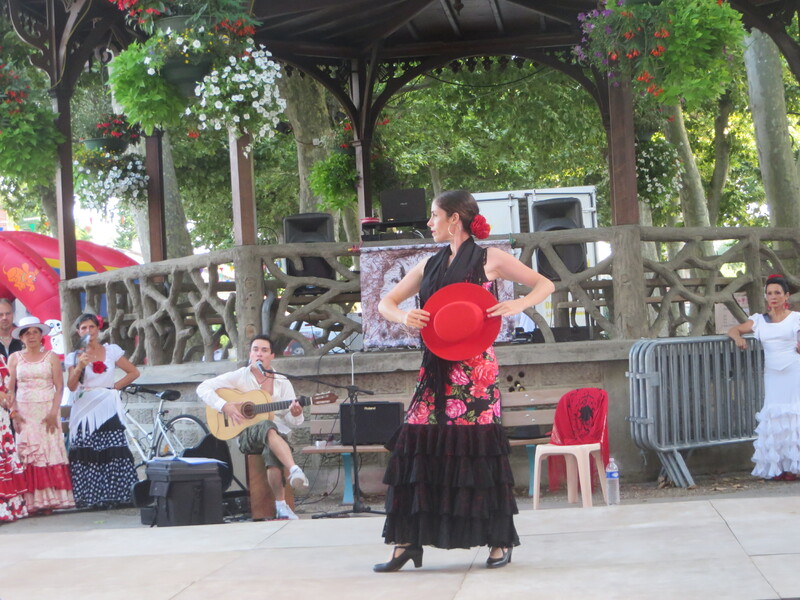 Hundreds of local families filled long tables and chairs to eat, drink and enjoy the music and Flamenco dancing! 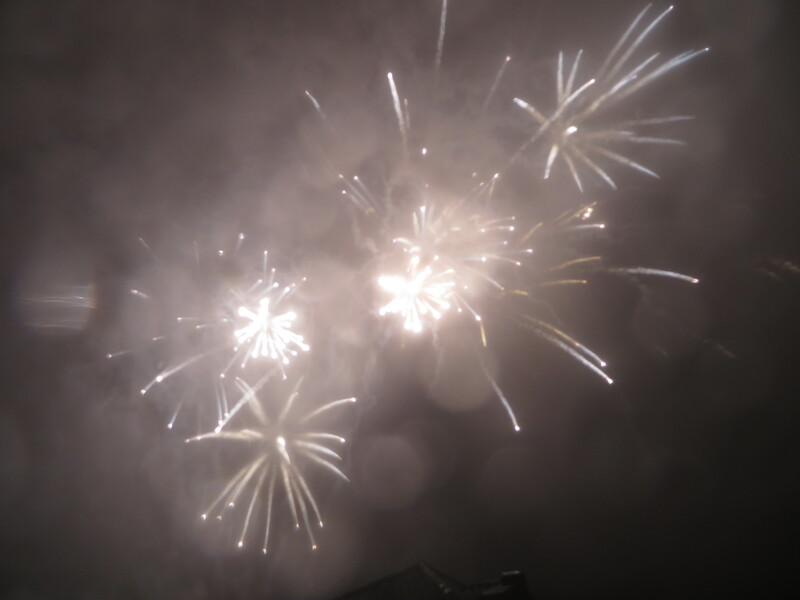 Wonderful atmosphere & the fantastic lady from the tourist office even spotted us & asked if we were OK with ordering, etc !! This is what we enjoy most! 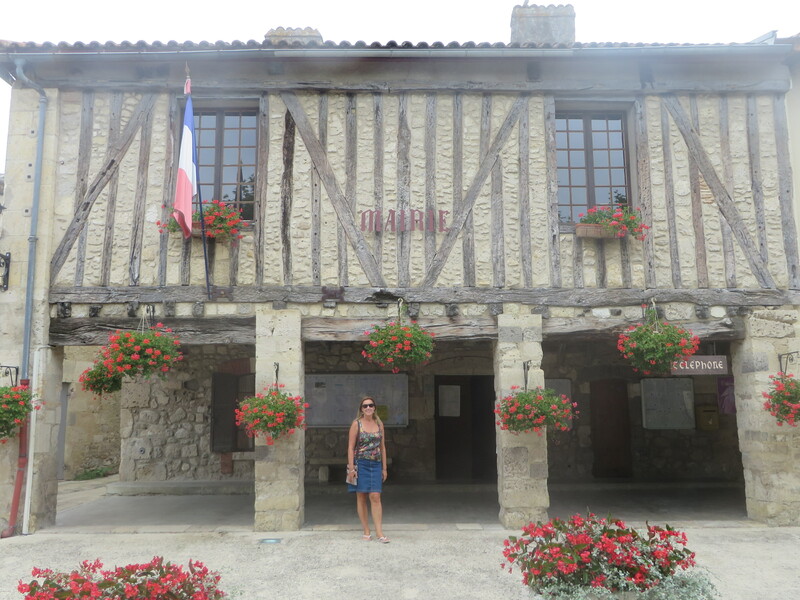 Continuing south, Fourcès is picturesque with its circular “town square” & historic mayors office (Bev is standing in front of)and Fourcès Chateau which is a B&B.! 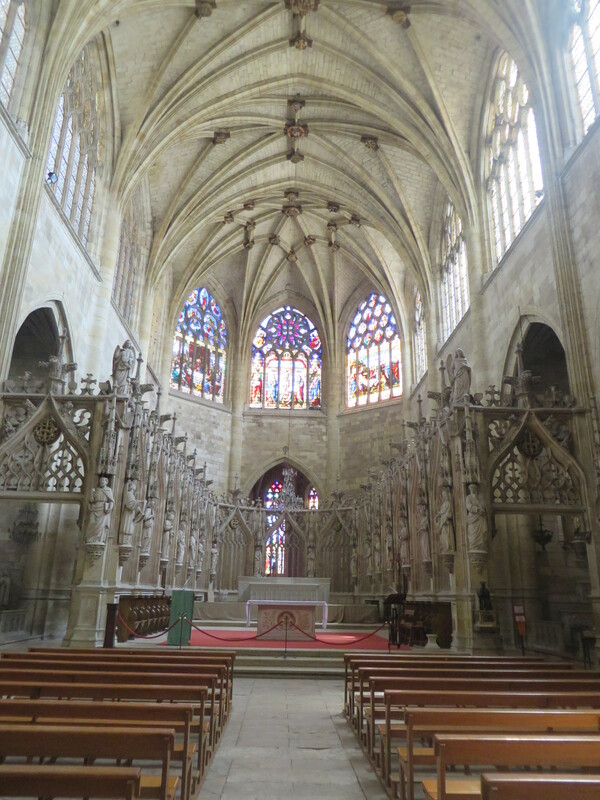 In Condom, with its beautiful cathedral and canal, we chat to bikers & walkers of the Camino de Santiago pilgrimage. Mark is now inspired to do this too! 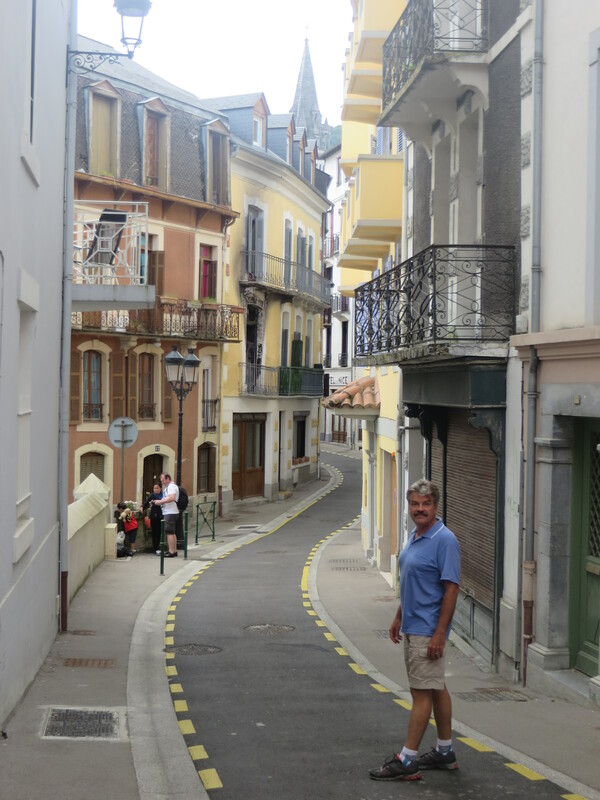 Bev is writing this in the town of Lourdes, famous for its religious significance. In 1858, a young girl of 14, Bernadette, went looking for firewood in the grotto (cave) called massabielle, beside the Grave River & she had the first of 18 apparitions there. On the cavity of the rock grotto, a lady dressed in white, surrounded with light was smiling at her. “A small young lady” (uo petito damizelo) passed on the message given to her of “living like God would want us too – repent and believe the Good News”. On July 16, 1858, Bernadette visited the Grotto for the 18th and last time and said “I have never seen her so beautiful before.” On January 18, 1860, the local bishop declared: The Virgin Mary did appear indeed to Bernadette Soubirous. 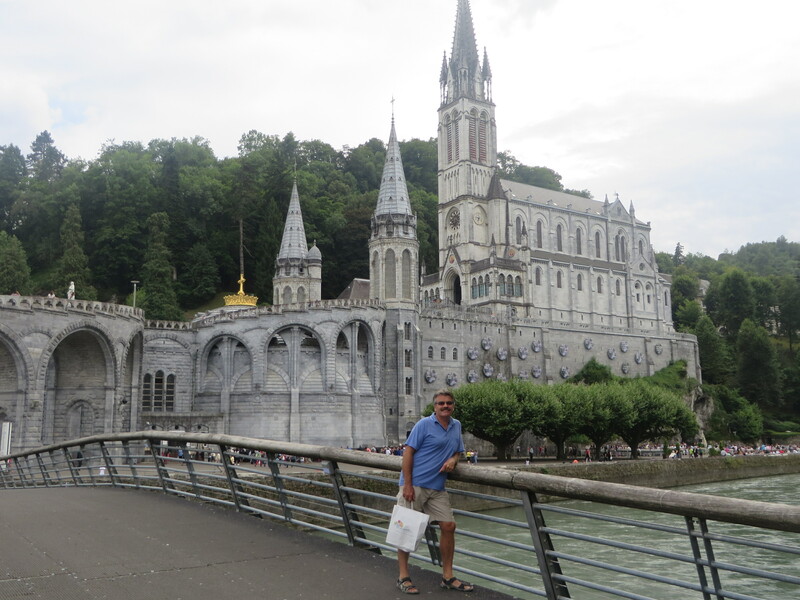 There are hundreds of people here in wheelchairs from all over the world to attend church services & visit the sanctuary of Our Lady of Lourdes. 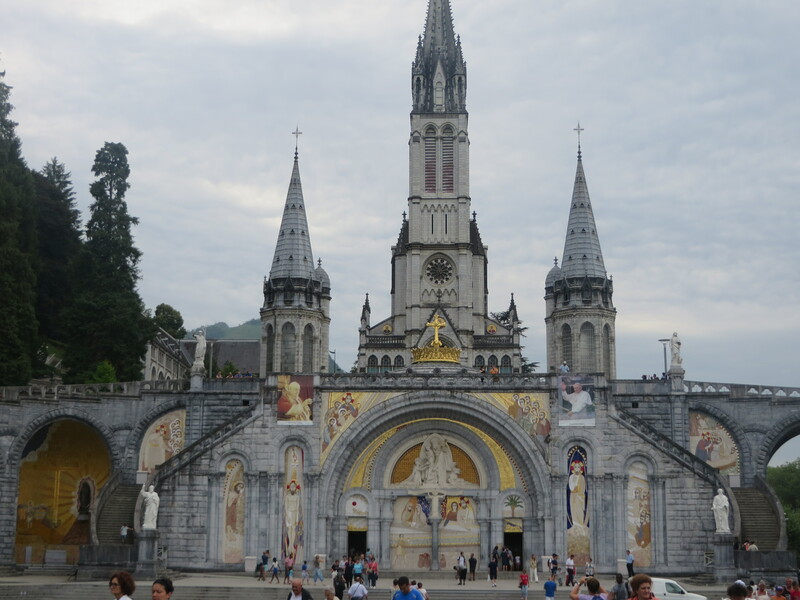 Today Lourdes has a population of around 15,000, but it is able to take in some 5,000,000 pilgrims and tourists every season. The Roman Catholic Church has officially recognized 69 healings considered miraculous. Cures are examined using Church criteria for authenticity and authentic miracle healing with no physical or psychological basis other than the healing power of the water. 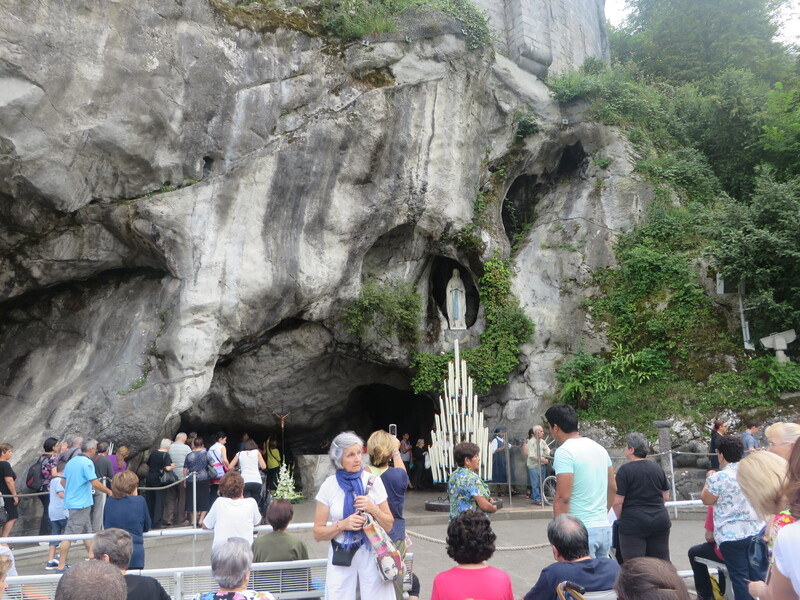 More info here : http://en.wikipedia.org/wiki/Lourdes_apparitions . 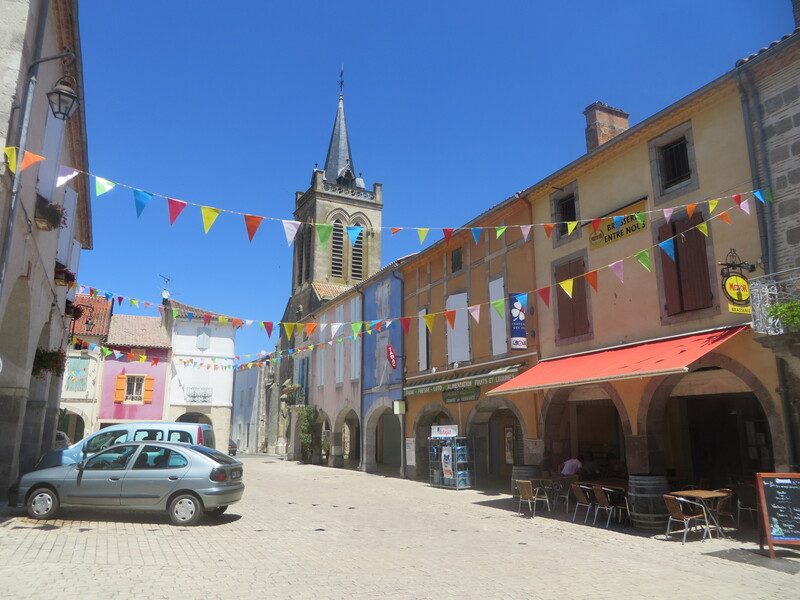 As we approach the Pyrenees, the number of motorhomes is increasing … most are heading up the mountains to join us in the fun and mayhem of the real Tour de France!! 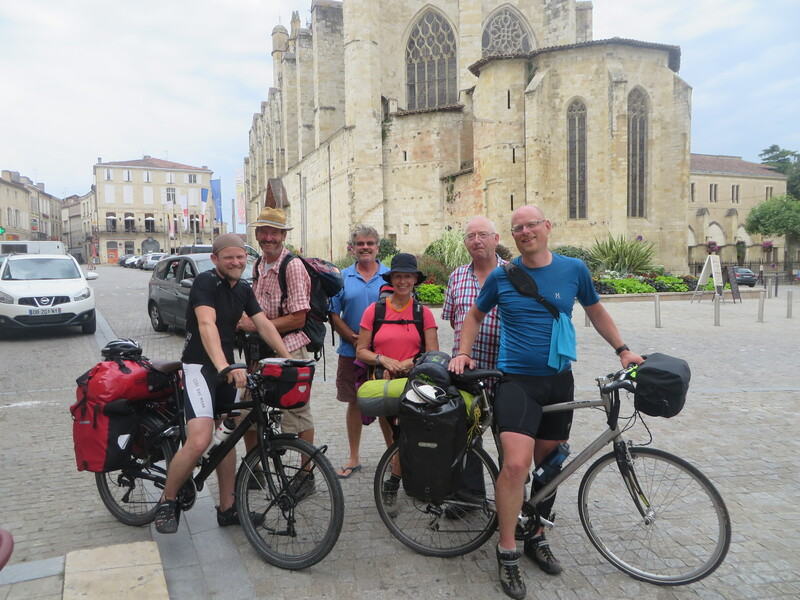 We begin the slow 20km drive up the Col du Tourmalet on Monday with the couple from Norway next to us in Lourdes ….. and 100’s of other like-minded enthusiasts.! We hope to find a safe vantage point for our camping cars ½ to ¾ the way up the mountain & wait there for the two days until Stage 18 heads up on Thursday afternoon … stocking up on food and drink, sunscreen and reading material!! Bev has a “French” book she will slowly begin reading in the idle hours of the wait for the circus to begin – as in IN French – not about France!! …. 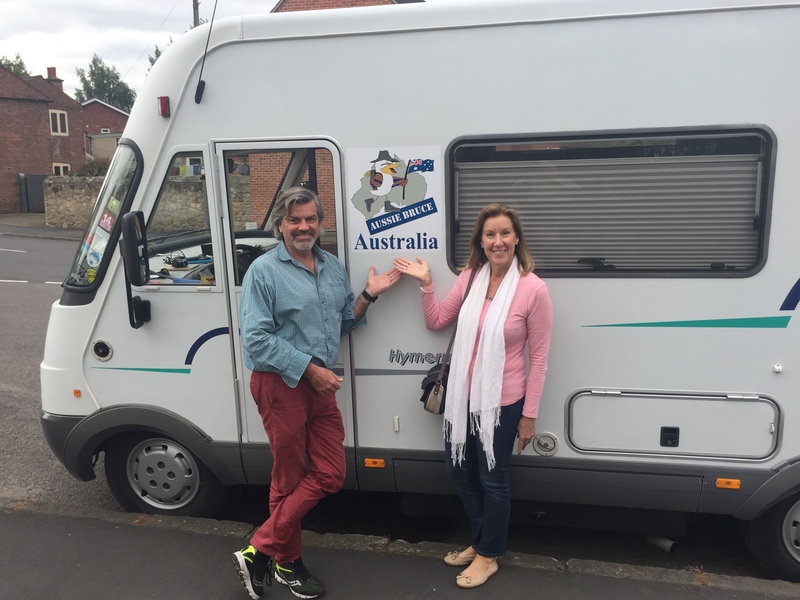 We have our Aussie gear ready to wave and cheer on Richie Porte (Tassie guy) from Team Sky and the Aussie guys from Orica Green Edge (team owned by the JAYCO Caravan owner) ……Oh no!! Major dilemma – as we pull out the Aussie paraphernalia – something is missing……where has Mark’s kookaburra costume gone??!!?? 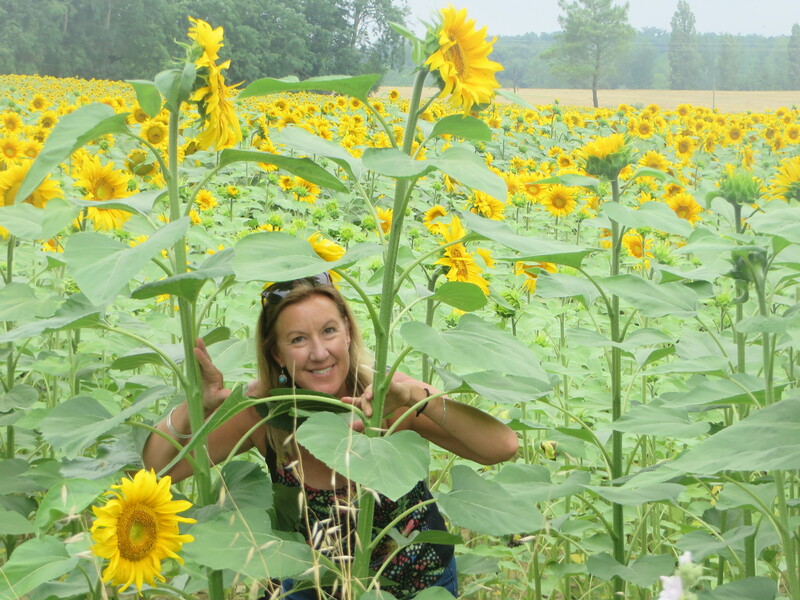 Bev takes time to “smell the roses” …. er…. the sunflowers!? Delightful read. What an experience! Greetings from Pete and Su. 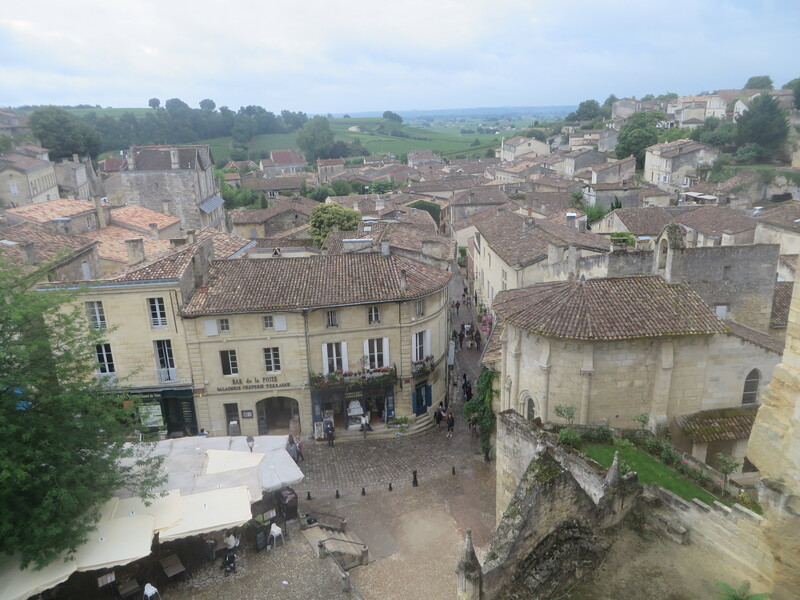 Good to read your blog and glad to see you are still enjoying your gap year! Hope to see you you both when you come to England.